Wow Sloane was so so so bad today. Needs a serious regroup. d_b_prince and gn169813 like this. Miserable match from Sloane, what is she doing? So bad! Patrick345, Perun, Ed Hominan and 1 others like this. Trolling TF a bit is necessary to have some specific kind of a fruitful discussion. No telling who's gonna win Miami at this point. I'm not even a Sloane fan, and yet I'm concerned about where her head is because it's not on the tennis court right now. Not a good start to the season for her. 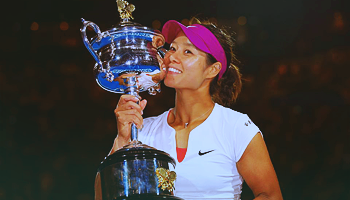 Just realized her record is 6-6 this year... and no hard courts again until July. Her attitude was fine other than being obviously frustrated from playing these types of players. Her footwork, however, was atrocious. Sloane had about 3x as many winners but also 5x as many errors. So frustrating to when she loses to players who aren’t going on to do anything else other than lose the next round. If you’re gonna lose, at least lose to someone with a chance of winning the tourney for crying out loud. This was a prime example of wanting but not executing. Rinaldy said the right things. You gotta commit. You gotta move your feet. Make those small adjustment steps. Also she told Sloane to go forward but Sloane has never played great volleys and mishit a lot of them. Sloane lost due to Maria unnerving her and not moving her feet. Maria also didn't do anything wrong out there, very tough to put the ball past her. One piss-poor match during a slump negates one's well-documented all-court gamestyle according to TF expert, Aaron. Anyway, she deserved to lose this. Zero confidence and getting angry instead of just fixing her footwork...just compare this to her game-plan in their match in Cincy last year. She needs to get a consistent team/coach and regroup. I really don't understand what Sloane thinks really? If you hardly play you cannot expect yourself to be clutch at important times or get into any kind of shape. She's badly out of shape and was missing routine half court balls by miles. Has the girl even worked out a little in the last months? Losing comfortably to haddad maia, voegele and maria. acapulco, indian wells, miami. 3 terrible tournaments really. Don't expect much from her on the clay either. Elena, thank you for all the joy you gave me, you will always remain in my mind. Wow! Can you imagine Maria Vs either Niculescu or Hsieh? Sloane needs a coach ASAP. She looked totally lost out there. So many seeds are out. Now I'm thinking that maybe Andreescu can do the double sunshine. I wish Simona were playing at a high level because the draw has opened so much that at this point who knows who's gonna win the whole thing. Today 01:13 PM by Michael!